Ever have one of those days where SoftChalk just doesn't seem to be working quite right? You know that you just used it a few days or weeks ago and everything was fine. Then BOOM, it is freezing up on you more or it won't finish loading and just continuously spins. Whatever it may be, something just is not right. The support team here at SoftChalk has a little tip that may be just the trick to get you rocking and rolling while creating content again! 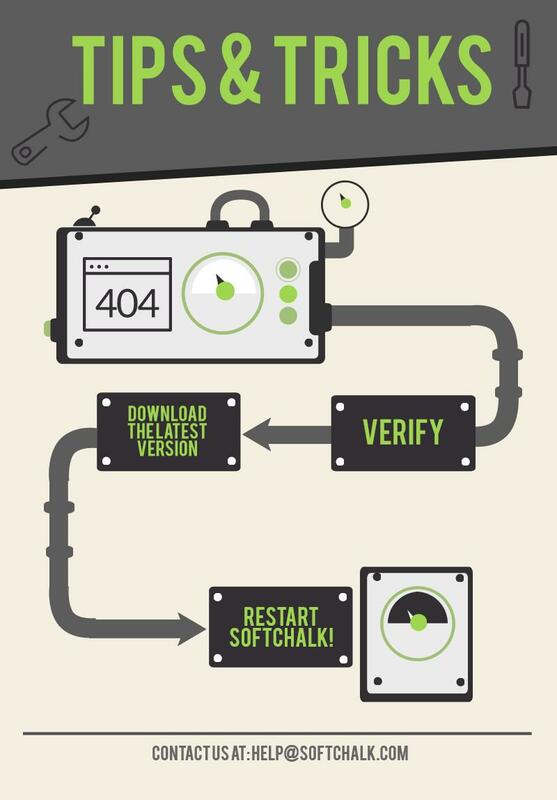 VERIFY: Check to see that the version of SoftChalk you are running is the latest update we have released. SoftChalk Cloud Web launch users- When launching SoftChalk you will always be automatically updated to the latest version. UPDATE: A notification will pop up, when following the steps above, if you DO NOT have the latest version of SoftChalk. At this point, please 'Run' the update. RESTART: Once the update is complete, close out of SoftChalk and restart the program. With SoftChalk continuously striving to improve our product, we understand some updates may get overlooked by our customers. Making sure you always have the latest update will hopefully make that those little glitches you experience disappear into the digital atmosphere. However, if the issue persists or is a little more in depth than described above, please feel free to email the support team at help@softchalk.com and they will be happy to assist you.